DirectSuggest is excited to team up with the most forward-thinking community in the world of HR. 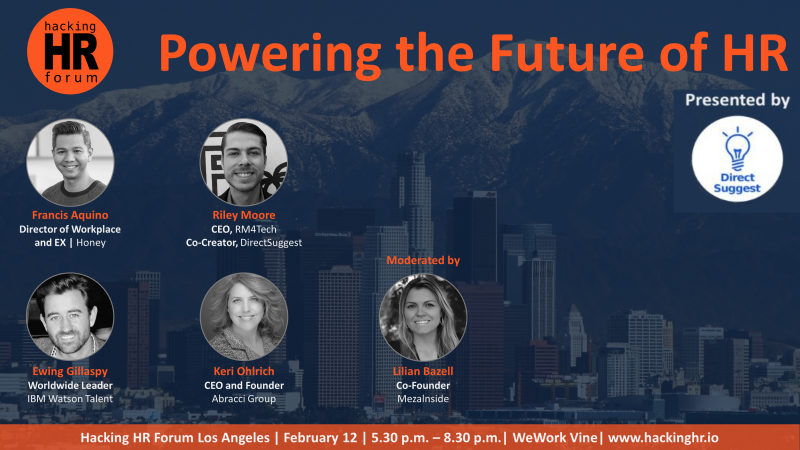 Hacking HR Forum Los Angeles presented by DirectSuggest is less than a month away, being held in Hollywood at WeWork Vine on February 12th at 5:30 PM to 8:30 PM! Hacking HR is a community driven by Forum Events and Chapters throughout the world discussing the intersection of technology and Human Resources. Hacking HR can be found in cities such as New York City, the Silicon Valley, Chicago, Washington DC, London, Toronto, Vancouver, Seattle, Miami, Zurich, Lagos, and more. Believing that HR can be the most important piece in propelling organizations through the transition of digitalization and the future of work, their purpose is to create a global community interacting around this. To assist in this facilitation, Hacking HR has placed emphasis on providing valuable tools that will help organizations with the future of work. This includes various HR technologies such as DirectSuggest. We are excited to work with Hacking HR to bring this powerful community to Los Angeles. We have also teamed up with Los Angeles Mayor Eric Garcetti's Innovation Team, catering service Nybll, and beverage provider Purity Organics (please view the links for more information on our partners). The event features a powerful panel of four speakers with diverse backgrounds. Each panel member will make a content focused eight-minute presentation. After the presentations are made the panel will interact with the audience through Q&A, discussing and providing answers to what is on their minds. Due to the importance of creating a community built on growth and collaboration, time is for networking before and after. Hacking HR Forum Los Angeles presented by DirectSuggest will be moderated by Lilian Bazell. Francis Aquino , Director of Workplace and Employee Experience at Honey - "Evolving Physical Space to Recognize the Value of Employee Experience & Engagement"
Ewing Gillaspy, Worldwide Leader at IBM Watson Talent - "Why Artificial Intelligence is the Best or Worst Thing for Your HR Career"
Keri Ohlrich , CEO and Founder at Abbracci Group - "Developing the HR Warrior Within"
Riley Moore , CEO at RM4Tech and Co-Creator of DirectSuggest - "Reimagining Employee Engagement with a Statistical Outlook"
Is your organization looking for an affordable and easy-to-use solution to capture employee suggestions? DirectSuggest, the suggestion box reimagined, connects your decision makers directly to your employees and makes it simple for an employee to make suggestions with the assurance that they arrive where needed. For more information please click here. 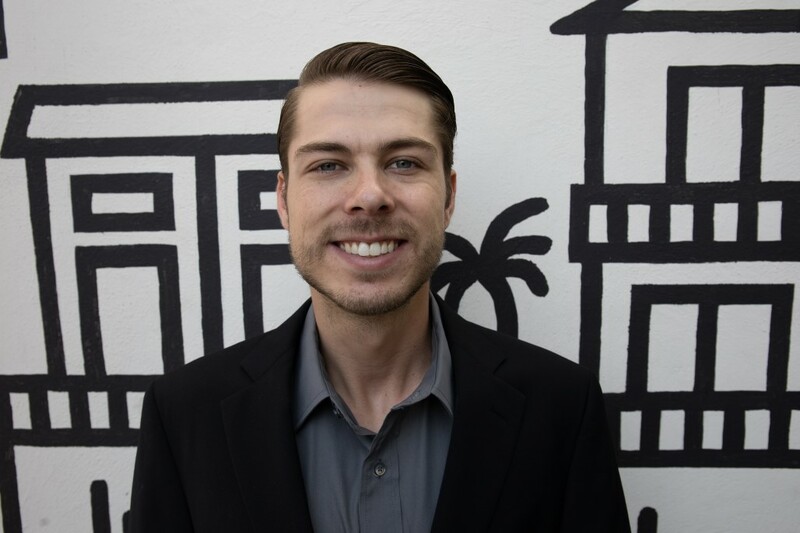 Riley Moore is a fresh face in the world of engagement and innovation. The 24-year-old CEO of RM4Tech, a family owned family run software company, has used his mix of technical and business influences to bring his creative vision to life. RM4Tech’s first solution, DirectSuggest, is the affordable and easy to use suggestion box reimagined. Another software product is scheduled for Q4 of 2018. His passion to empower individuals to use their creativity and voice to make a difference in the world is what drives him. Riley has gained a large following from his statistical and articulate insight, mixed with his unrelenting drive to change the world, gathering a following of over 19k followers on LinkedIn in only eight months. Riley has been nominated for the 2018 Sacramento Business Journal 40 under 40 and DirectSuggest has been nominated for the 2018 Sacramento Business Journal Innovation Awards. Copyright 2019 by RM4Tech LLC. All Rights Reserved.